1 of 4 Heat oven to 350 degrees. Spread coconut onto a baking sheet. Bake at 350 degrees for 10 minutes until lightly toasted. Cool. 2 of 4 Meanwhile, coat a 9-inch deep-dish pie plate with nonstick cooking spray. Roll piecrust slightly and fit into prepared dish, fluting edge. 3 of 4 In a bowl, whisk corn syrup, sugar, eggs and vanilla. Stir in pecans. Spread coconut into piecrust; top with chocolate chips. 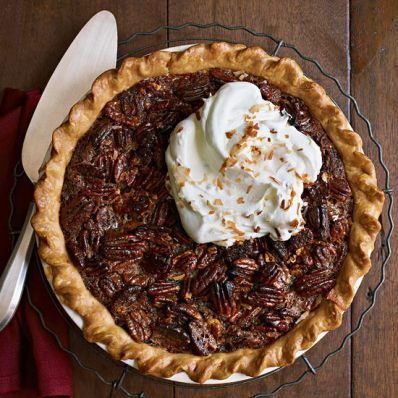 Carefully pour pecan mixture into crust. 4 of 4 Bake at 350 degrees for 1 hour, covering crust with foil if browning too quickly. Cool at least 2 hours, then refrigerate until serving. Garnish with whipped cream and toasted coconut, if desired.